Advantages: Great wartime footage of a neglected conflict, terrific inspiration for modellers. Korea - the forgotten war. Until viewing this DVD I couldn’t remember the last time I saw anything about Korea. 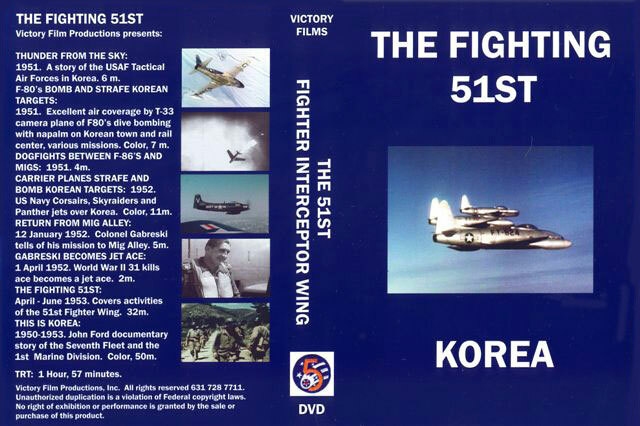 The DVD starts out with an Air Force documentary entitled “Thunder from the Sky - The Tactical Air Forces in Korea.” Some of the unique footage includes C-47s with loud speakers. This is not your typical configuration for the cargo plane and would make an interesting conversion. F-80 Shooting Stars, T-6 Texans and Skyraiders are shown in action. It seemed strange to see the T-6 with rockets and gun pods. While a great trainer it would seem slow to me. That shows how much the UN forces were caught off guard by the North Korean invasion. F-80s and F-84s are seen making gun runs. It is interesting to note the speed differences from the WWII camera footage. These pilots were really on the cutting edge. A couple of shots that were unique were shots from trailing aircraft bombing targets. An airplane that was instrumental in the war was the B-26 Invader. The amount of ordanance this airplane can carry is phenomenal. You are treated to guns, rockets, and bombs. It is a flying battleship. The following video is a bunch of F-80s strafing and bombing targets in full color over a snow cover landscape. They go straight down and enter into napalm runs. Beautiful inflight shots and attacks highlight the team work required in the jet age. The F-80 can carry a bunch of different ordanance and you see all of them and in action too. There are huge bombs, napalm and rockets. The next series features Sabres and Mig-15s fighting it out in Mig Alley. Gleaming Mig-15s are being shot down left and right. The video is even better than “Dogfights”. The Navy isn’t forgotten and they are highlighted in the next sequence in beautiful color. Skyraiders resplendid in navy blue. This aircraft is a flying ammo dump and doesn’t even require the catapult to get that off the deck. Amazing. Panthers are seen launching with helicopters hovering in the back ground. Very reminiscent of “Bridges of Toko-Ri”. I was looking for Fourney and his green top hat. Corsairs are shown being bombed up with rockets, bombs, napalm and extra fuel tanks. Both the Corsair and the Skyraiders don’t use a catapult despite having every lug and hard point being loaded up to the teeth. Some of the protective ships are seen providing the screens around the carrier and the seas are not very smooth. After watching the carrier deck pitch down into the water it became obvious to me why I became an Army pilot. It is hard to fly when you are green. Seeing the aircraft go feet dry, Skyraiders are loaded down with everything, including the kitchen sink. What a great aircraft. Marine Corsairs are highlighted going in low level and shooting up everything. Then those F4U-4s come in for landing and again I remembered why I fly helicopters. They literally plant them on the deck. It is amazing that the landing gear doesn’t come up through the wings. The deck hands coordinate the ballet on the flight deck, landing aircraft and elevator operations all at the same time. Truly impressive. Return from Mig Alley brings the return of a WWII icon, Francis “Gabby” Gabreski lands his F-86E-10-NA complete with “Gabby” markings and four red stars. Gabby gives a propaganda pep talk in front of serial number 51-2740. It seems highly dubbed as sometimes the words do not quite synch up with the lips. Another sequence occurs when Gabby makes jet ace in FU-734 and it isn’t his airplane. Gabby is the feature of the next Air Force Propoganda film which gives this film its title, “The Fighting 51st”. Gabby gives the old teamwork pep talk as he briefs new crews, maintainers and weather people. You can say whatever you like but when you see the rivets on the F-86s they are quite noticeable. There are various shots of nose art and maintenance actions. Diorama ideas are abundant with revetments and PSP taxiways. There are good air-to-air shots of Mig-15s being shot down. A full color John Ford documentary, “This is Korea-7th Fleet and 1st Marine Division” is the next offering. Real closeups of napalm attacks and battleship salvos. The documentary is very anti-Communist. Try as they might the Marines look beaten and lack the winning look of a WWII documentary. M-26 Pershing tanks are shown in action, as well as a few M-4 Shermans. Interestingly, is the use of guilt in this documentary. It is unlike any WWII documentary that I can remember seeing. Chesty Puller the four time Navy Cross winner is shown to be the great Marine that he was. Refueling in heavy seas will impress you with the amount of coordination and level of difficulty. The Mighty Mo is highlighted. Corsairs and Skyraiders are shown with the Skyraiders in a very close formation. The attack aircraft shoot off some rockets and the documentary ends as does the DVD. Korea was a unique war and coverage of it seems to be lacking. This DVD gathers a significant amount of video footage and presents it in a clear format. The film, both color and black and white are representative of the harsh conditions in the war. This DVD is typical of the quality historical video I’ve come to expect from Victory Films. They present a unique war time view of the conflict. I highly recommend this title and the rest of the series. Great research material, color and B&W film makes these DVDs a great value for the money.